This strikingly beautiful sea chart of the English Channel vividly renders the Channel between Sussex and Kent and Picardie in France. The map is oriented to the west, perhaps in part to depict the area’s dangerous shoals, shallows and rocks which could easily sink seagoing vessels of the era. Van Keulen’s chart illustrates these perils on both sides of the Channel in great detail, highlighting the dangers along both coasts, and those extending from the coasts into the Channel. Water depths, anchorages and sandbanks are clearly shown, and cities and smaller settlements and ports are named. Rhumb lines radiate from a large number of points, especially in the more westerly area of the Channel. These lines create a grid to assist the cartographer in measuring distance and in more accurately measuring plotting various points on the chart. The resulting charts helped sailors navigate their way and enabled cartographers to reproduce and refine their maps. This sea chart is embellished in the lower left corner with a title cartouche in five languages and mileage scales in four languages. Miniature crossed sabers and the date 1690 positioned between the compass rose and the coast of England refer to The Battle of Beachy Head (Fr. Battle of Bévéziers), a naval engagement fought on 10 July 1690, during the Nine Years' War. The battle was the greatest French tactical naval victory over their English and Dutch opponents during the war. The Dutch lost six ships (sources vary) and three fire ships, whereas the French did not lose a vessel. Control of the English Channel temporarily fell into French hands but Vice-Admiral Tourville failed to pursue the Allied fleet with sufficient vigour, allowing it to escape to the Thames. Of especial interest to some may be the depiction in detail of the entire length of the area which came to be known as the Normandy Beaches, the landing sites which saw such horrific loss of life in WWII. This sea chart shows some of the difficulties the Allies faced as they approached the coast to face Hitler’s forces. The Van Keulen family was one of the most prolific of all Dutch map making families. 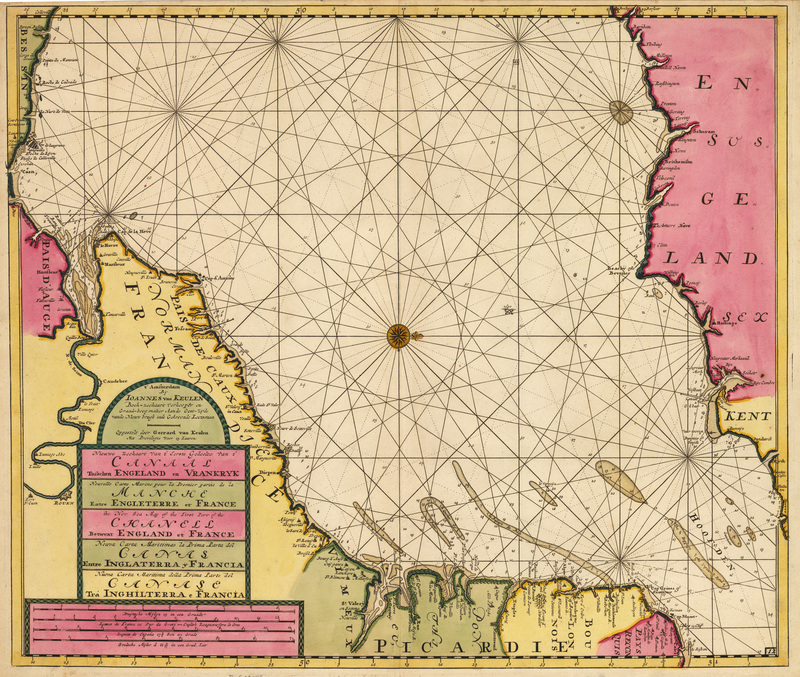 The family began producing maps and sea charts in 1680 and in the 18th century their firm became well-known for its important maps, charts and books regarding all aspects geography, navigation, etc. One family member became the official Hydrographer to the East India Company, and until the opening of the Dutch Hydrographic Office, the firm produced what were considered the official Dutch sea charts. Condition: This marvelous sea chart is in A condition. Printed on heavy paper with original coloring.